An analyst plugging the stock on TV did more for the satellite communications specialist than a solid earnings report. SpaceX and ORBCOMM have a cozy relationship. Photo: ORBCOMM. 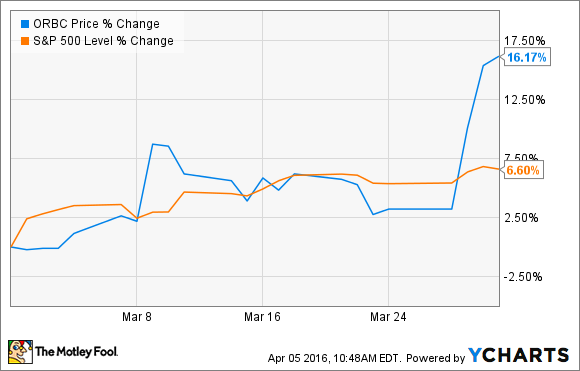 What: Shares of ORBCOMM (NASDAQ:ORBC) rose 16.2% in March 2016, according to data from S&P Capital IQ. At the start of April, shareholders could look back at a massive 72% 52-week return. So what: March started out quietly enough, and ORBCOMM was actually trailing behind the broader market for most of the month. The provider of Internet of Things technologies and machine-to-machine communications solutions reported fourth-quarter earnings along the way, but the 6% pop that followed faded away quickly. On March 29, the tenor changed. On CNBC's "Halftime Report," analyst Jim Lebenthal explained that ORBCOMM was the secret to his market-beating portfolio's success. Lebenthal beats the ORBCOMM drum often on this show, but viewers really latched on to the message this time. The stock soared 12% higher in two days on impressive trading volume, just before closing the books on March. Now what: This company taps right into the exploding Internet of Things megatrend, of course. ORBCOMM's unique niche is providing connectivity in hard-to-reach places, as the firm's OG2 low Earth orbit satellite network covers territory that most communications networks can't reach. To launch these satellites, ORBCOMM has relied heavily on Elon Musk's SpaceX rockets, gaining promotional value every time the Falcons stick a landing on the return trip. So ORBCOMM holds a promising space in the IoT universe. Do keep in mind that the company is a long way away from stable earnings or positive cash flows. The long-term promise is balanced by lots of risk, and more than 10% of ORBCOMM's float is sold short. Yes, that might lead to a tasty short squeeze somewhere down the road. But it is also entirely possible that the short sellers know what they're doing, and that the recent gains cannot be sustained. Invest accordingly -- in small bites, and only if you don't mind big swings both up and down.